A pretty upsetting and horrific film about a mother who is incredibly abusive to her child and has some major psychological issues. An interesting, yet disturbing movie about an abusive mother who has no idea about how to raise a child. This is the story of famous actress Joan Collins, who adopts two children and then fulls apart while attempting to raise them. She is a terrible person before the kids, and then having them around only makes her worse. The movie chronicles her relationship with her daughter, and how horrible it is. it would have been nice to see more about her son as well, but this film steers clear of that. It also has a slow start, before we meet christina, the daughter, but definitely picks up after that. Mommy Dearest is a fascinating, yet disturbing movie. It’s the film about actress Joan Crawford and her obsessive, horrible attempts at being a mother. Crawford wanted to have children for all of the wrong reasons. She wanted them for the publicity, and even admits as much in this movie. As a person, she was a mess, and having children only gave her people to torment and subject to her awful ways. The movie begins before Collins has made the decision to have children. She is single, although she dates. She has been getting older, and while she is still in movies, it doesn’t seem like her film career will go on for that much longer. Collins has a bright, funny personality outside of the house, but once inside, behind closed doors, she is a nightmare. We only get hints of that early on, like when she gets angry with her cleaning woman, studying the dust and dirt on the tops of cupboards and the floor. She reprimands this woman for not doing a very good job and shows her how to improve. At this point, it seems like Collins is just obsessive compulsive. But this is only the beginning, and it is about to get a whole lot worse. Collins has a difficult time adopting a child from an agency. While she does have a large income, being a single mother who is away from her home often for work, makes her an unlikely candidate for adoption. She pulls a few strings and uses her connections to get a child from somewhere else, and soon, she has a little girl. This is Christina, a little blonde girl who has no idea what she’s in for. The first sign that Crawford will be a lousy mother comes after Christina has a large and extravagant birthday party. This is the famous scene where she and her mother are both dressed in matching white outfits. Christina receives a lot of presents and is all excited about opening them, just as any kid would be. After she has finished opening the presents, her mother asks Christina to pick out her favorite. Christina does so, and her mother says that this will be the only present Christina gets to keep. All the rest will be donated to charity. It isn’t long before Joan Collins is able to adopt a second child. This one is a little boy. She also continues to see the same boyfriend. Then one night, she gets really drunk and tells him off. She makes her boyfriend feel inferior to the point where he decides Crawford is not a good person and not somebody who he wants to spend any more time around. She tries to apologize and get him back, but it’s too late. The man has made up his mind and leaves her alone on her bed. All of this makes Joan a much angrier and more abusive parent than she already was. She has one of her two most horrendous scenes when she walks into Christina’s bedroom one night and opens the closet door. Christina is fast asleep in the bed and is awoken by her mother going insane because her daughter has used wire hangers to hang up the clothing. Crawford grabs one of the hangers and begins to beat Christina with it. Then she makes a mess of the bathroom floor, telling Christina it is not clean and dumping detergent all over the place. Christina is forced to clean it herself, left alone on the bathroom floor, just like her mother’s boyfriend left her mother all alone on the bed. Aside from her boyfriend leaving, Crawford has other problems as well. Despite winning an Oscar for Mildred pierce, the studios are done with her. That’s because she has gotten too old and they are onto the next big thing, without looking back at the past. The scene where the studio head has to tell her this is pretty powerful, and reminiscent of the scene with Cecil b. demille having to hide the truth from his aging actress in sunset boulevard. Of course there, demille was passive and kind. and not really honest with his former actress. Here, the studio head is pretty much the opposite. It isn’t long before anything Christina does drives Crawford crazy to the point where she decides to send the girl off to boarding school. Christina is terrified of the idea and will do anything to not have to go, but her mother isn’t listening. Not even Christina’s heartbreaking tears have any effect on her mother, and so Christina is forced to leave her home. At this point, if we haven’t noticed already that her brother has hardly been in the movie, it certainly becomes apparent here. This isn’t really the movie of Crawford as a bad parent as much as it is the movie about the relationship between Crawford and her daughter. After many years away, Christina has become a young adult and we join up with her again. Her mother comes to the school when Christina has been caught making out with a boy. Collins decides to take her daughter out of the school at this point, and to bring Christina home. The two of them are at odds over the whole thing, and by the time they get back to the house, and inside those closed doors, they are really going at it. When Christina refuses to listen to her mother, Collins proceeds to strangle her daughter. This is the most horrific scene of the movie, although it’s a close call between this one and the wire hanger’s scene. Mommy Dearest is certainly an uncomfortable and disturbing film, but it’s also kind of fascinating. I wish there was more about the brother, and would have liked to see how he handled the situation with his mother, and if the relationship between he and Collins was any different. Still, with a movie that focuses solely on the relationship between the mother and daughter, this film has a lot going for it. 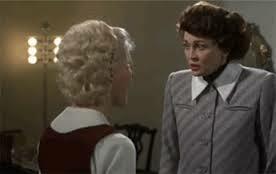 Faye Dunaway is terrific as Collins, playing her as absolute villain. The ending, involving the will and the book that got made into this movie is pretty good too. The film is a little slow at the start, but it definitely picks up as it goes along.